I love banana bread, but the full fat version isn’t possible for an everyday breakfast. So I threw together this recipe. I like it — it’s not too sticky and it has a big banana flavor. But yeah, it is low-fat so it is a bit spongy. Preheat the oven to 350. Now mix everything together in a bowl and pour into a loaf pan. Bake for 55 minutes or until the toothpick inserted in the middle is clean. It works for me and my breakfasts. Plus, I add a little strawberry jam or cashew butter and it makes it taste much better! Variety Deli opened up several months ago, but I never went…until recently. 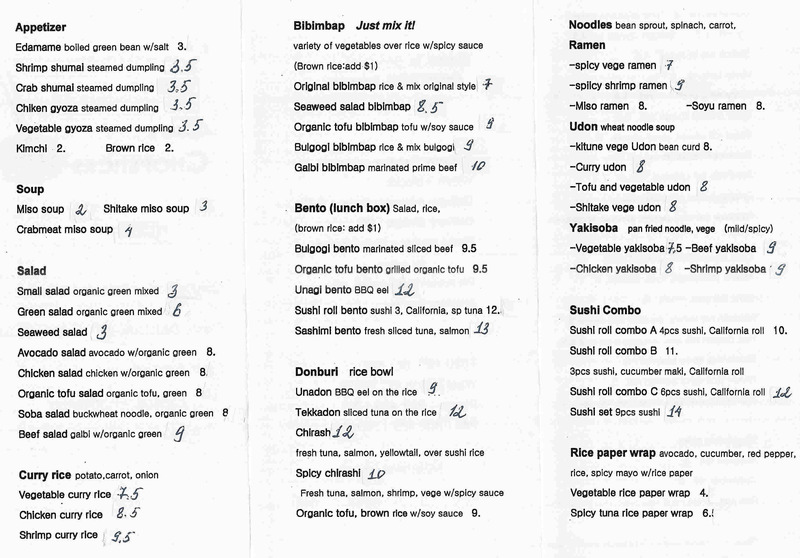 Here are photos of their menu. Atmosphere: The interior is fun with red walls and white tables and chairs. In the back of the deli, there’s mirrors so the place seem a bit bigger than reality. Service: The woman behind the counter was very nice and was fast when she was making my sandwich. Overall: For a quick sandwich, it’s a good spot. Preheat the oven to 400. BTW, make sure to clean those potatoes — check out the before and after photo! Then coat the potato wedges very well in the vegetable oil. Mix the other ingredients (rosemary, garlic powder, onions, Parmesan cheese, and bread crumbs) in a separate bowl. Now put the potato wedges (making sure they’re not touching) on aluminum foil on a baking sheet (or I used my cast iron skillet). Bake for 20 minutes and then flip. Then bake for another 20 minutes or until they’re crispy. Food:I ordered the veggie ramen which at first, was delicious. I’ll talk about my initial thoughts on the food first, then go into the after-thoughts. The broth wasn’t too salty and had a little heat. The ramen noodles were cooked perfectly. The problems with the vegetable ramen? There weren’t a lot of veggies — a couple of bean sprouts, spinach, and tiny shreds of what appeared to be carrots, zucchini, and green onions. I slurped my way through the bowl and while I was incredibly full, I also felt there was a weird after-taste. Is there MSG in their soup? Does anyone know? And while I was there, I saw someone’s bento box. It was huge! Think the size of a cafeteria tray — wow, a lot of food I think! Service: When you walk in, you can either look at their board or at takeout menus. Then you order and pay at the counter. They give you a number and you wait until it’s called. Atmosphere:The interior is quite spacious and comfortable — a bit Zen-like. Unlike some restaurants, they don’t cram too many tables and chairs. Plus, they use eco-friend containers and utensils, recycled napkins, etc. All good stuff! Overall:I really liked the veggie ramen, but would love it even more if they had more veggies in there. Also, I’d love to know if they add MSG to their soup. I think for now, I’ll stick to Java Green’s “chicken” ramen. But I’ll go back to try their very reasonably priced sushi and a bento box. 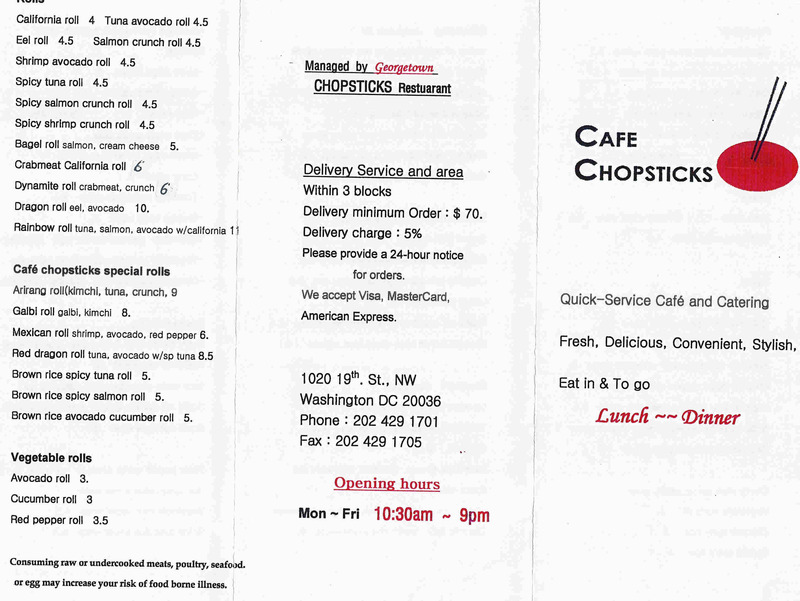 BTW, they do offer delivery, but only within a 3 block radius, a $70 minimum order, 5% delivery charge, and 24-hour notice. Yes, I know everyone loves tuna noodle casserole. I mean, what’s not to love? But what I didn’t want to do is make it using canned condensed soup. What might be surprising for some is that it’s so incredibly easy and simple. Why use canned soup? This is a two dish recipe. Directions: Use a sauce pan to boil water. Once the water boils, cook the pasta untilal dente. Drain the pasta when done (do not rinse). Grab a 8×8 pan and lightly coat with non-stick spray. Put the drained pasta in the pan. Lightly coat the pan with Extra Virgin Olive Oil and add onions. Saute lightly until the onions are translucent and soften. Move the onions into the 8×8 pan. Quickly clean the sauce pan. Now use the sauce pan to make the roux. Melt the butter, then add milk and flour. Keep stirring and do not stop until the mix is thick. Add the cheese and mustard until the cheese is melted. Then transfer to 8×8 pan. Now add the vegetables — peas, corn, mushrooms, whatever. Mix everything together really well. Add salt and pepper to taste. Bake at 350 for 20-30 minutes. Unless you like crunchy noodles, I suggest pausing the baking to mix the ingredients together. If you want to make it less healthy, add the fried onions or more cheese to the top. Now that I’ve explained what “college student” recipes means, here’s the first one. And one of my favorite. It takes only a few minutes, but anyone can make this. Make your couscous according to the package directions. Usually, the instructions are to boil 1 cup of water. Then add your 1 cup of dry couscous. Remove from heat and cover. Let stand for 5 minutes. You can do this in the microwave too. Now put your frozen spinach in the microwave and heat until hot (about 5 minutes). OPT: Add the black beans and heat until hot (about 3 minutes). By the time your spinach and beans are hot, your couscous is probably done as well. Fluff the couscous with a fork. Put the couscous into the same spinach and bean bowl. Mix and add salt and pepper to taste. I also like to add cayenne pepper sometimes to add a little heat. Enjoy your healthy dinner. Plus, it’ll be perfect for lunch either hot or cold the next day. If you’re going to re-heat, add a little water beforehand.